The St. Lawrence Seaway stretches from Montreal to Lake Erie. Named after the St. Lawrence River, it is a system of canals that allows ships to sail from the Atlantic Ocean to the Great Lakes. 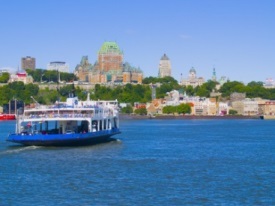 While cruising, ships pass through a series of locks allowing passengers to experience the seaway firsthand. The St. Lawrence Seaway includes the Welland Canal and Great Lakes Waterway and cities such as Quebec and Buffalo make their home along the seaway’s shores.